This week marks the 1000th anniversary of one of the most important battles of the Danish Conquest, fought at Sherston in Wiltshire on or around 25-26 June 1016. 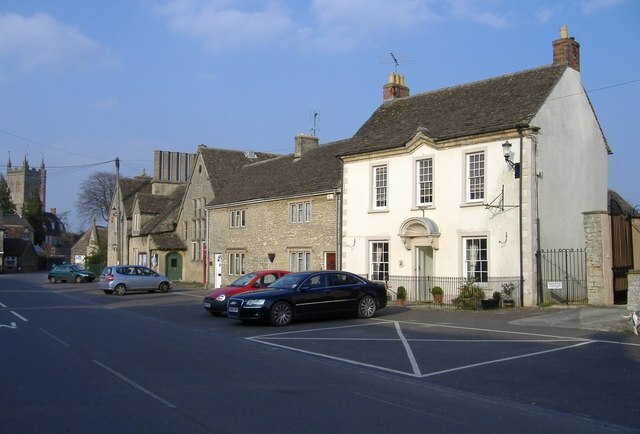 The Battle of Sherston might be largely forgotten today - though its anniversary is being commemorated in the village this weekend - but it features prominently in medieval narratives of Cnut's conquest of England. In this post we'll look at some of the many accounts of this battle, both the history and (perhaps more interesting!) the legend. Þa wæs Eadmund cyng ær þam gewend ut. 7 gerad þa West Seaxan. 7 him beah eall folc to. 7 raðe æfter þam he gefeaht wið þone here æt Peonnan wið Gillinga. 7 oðer gefeoht he gefeaht æfter middan sumera æt Sceortstane. 7 þær mycel wæll feoll on ægðre healfe. 7 þa heres him sylfe toeodon on ðam gefeohte. 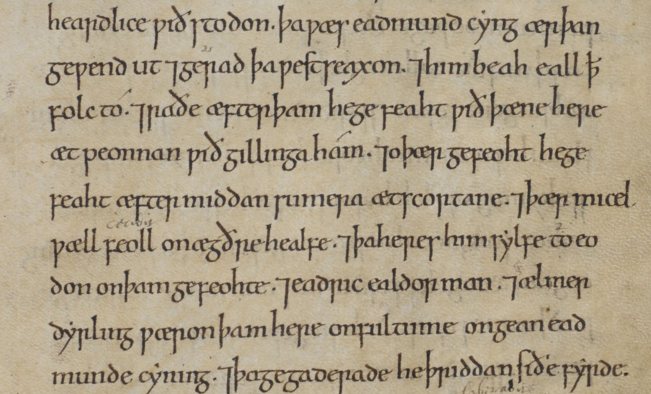 7 Eadric ealdorman 7 Ælmær Deorlingc wæron þam here on fultume ongean Eadmund cyng. 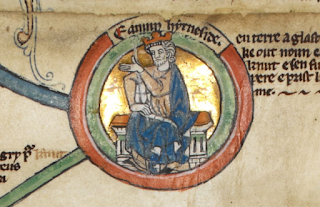 Then King Edmund had gone out before that [the siege of London] and rode into Wessex, and all that people submitted to him. And quickly after that he fought against the army at Penselwood near Gillingham, and he fought another battle after midsummer [June 24] at Sherston. There was great slaughter on both sides, and the armies themselves broke off the fight. Ealdorman Eadric and Ælfmær Darling were aiding the army against King Edmund. Then Thorkell, observing the time to have come when he could demonstrate his fidelity to his lord, said: "I will undertake to win this fight for my lord with my troops, and will not permit my king to be involved in this battle, very eager to fight as he is, inasmuch as he is a youth. For if I be victorious, I will win on the king's own behalf; but if I fall or turn my back, it will not be to the glory of the English, for the reason that the king will be left, and he will give battle again, and perhaps as a victor will avenge my injuries." Since this seemed to all to be good reasoning, he disembarked with the king's approval, and directed his force against the army of the English, which was then assembled at the place called Sherston. The Danish army had disembarked from forty ships and more, but still this number was by no means equal to half the enemy. But the leader, relying on courage rather than numbers, sounded the trumpets without delay, and advancing in the forefront and ever praying in his heart for the help of God, laid low all that came in his way with the sword's point. The English, indeed, were the more bold at first, and cut down the Danes with terrible slaughter, to such an extent, that they nearly won the victory and would have compelled their enemies to flee, if the latter, held back by their leader's words and being mindful of their own bravery, had not regarded flight with shame. For he mentioned that there was no place to which they might flee, that they were, of course, foes in the land, and that their ships were far from the shore, and that accordingly, if they should not conquer, they would necessarily fall together. After they had been rendered of better courage by this, they forthwith showed in battle how dangerous a thing is desperation. For despairing of a refuge to which to flee, they raged on against the enemy with such madness, that you would have seen not only the bodies of the dead failing, but also of the living, as they avoided the blows. Accordingly they ultimately gained the victory which they desired, and buried such of the remains of their comrades as they could find. After they had also seized the spoils from their foes, they returned and made themselves ready for an invasion of the adjacent country. This was the first honour which Thorkell brought to the arms of Knutr, and for this he afterwards received a large part of the country. Encomium Emmae Reginae, ed. and trans. Alistair Campbell (London: Royal Historical Society, 1949), pp. 21-3. While the Encomium talks up Thorkell's loyalty in this battle, other versions of events at Sherston are more interested in disloyalty - specifically, the treachery of the ealdorman Eadric streona, who is roundly blamed for things going badly for the English (as we've seen before in this series). Twelfth-century English historians have various tales to tell about Sherston, most of which centre on Eadric's dirty tricks. Although dating from more than a century after the battle, these sources may preserve some older traditions; if nothing else, they develop some of the narrative possibilities implicit in the earliest sources quoted above. In the following stories, we get different versions of two points in particular: Eadric's betrayal of his king, and the fact mentioned in the Encomium that the Danes were deep in Wessex and potentially in great danger unless they could keep together ('they were foes in the land, and their ships were far from the shore...'). [Edmund] went boldly to meet them in Dorset, and in a place called Penselwood, near Gillingham, he gave them battle, won, and put them to flight. After this, when midsummer had passed, and he had mustered an army, one greater than before, he determined to fight vigorously against Cnut, whom he encountered in Hwiccia at a place called Sherston. When he drew up his army according to the terrain and the forces he had, he moved the best soldiers into the front line, placed the rest of the army in reserve, and addressing each man by name, exhorted and entreated them to remember that they strove for their country, children, wives and homes, and with these most inspiring words he fired the soldiers' spirits. Then he ordered the trumpets to sound, and the troops to advance gradually. The enemy army did the same. When they arrived at the place where they could join battle they rushed together with their hostile standards and with a great shout. They fought with spear and lance, striving with all their might. 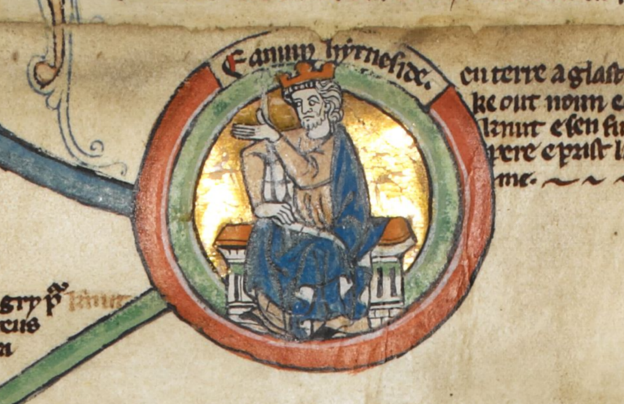 Meanwhile, King Edmund Ironside made his presence felt in fierce hand-to-hand fighting in the front line. He took thought for everything; he himself fought hard, often smote the enemy; he performed at once the duties of a hardy soldier and of an able general. But, because Eadric Streona, the most treacherous ealdorman, and Ælfmær Darling, and Ælfgar, son of Meaw, who ought to have been supporting him with the men of Hampshire and Wiltshire and with an innumerable mass of people, were on the Danish side his army was quite exhausted and quite overstretched. When the English perceived this they were appalled, more by the horror at the action than by any trust in the announcer, whence it happened that the waverers were on the verge of flight; but as soon as they realized that the king was alive their spirits rose, and they attacked the Danes the more fiercely, and they slew many of them, striving with all their might until dusk. When that arrived, as on the previous day, they separated voluntarily. But when the night was far advanced Cnut ordered his men to leave the camp silently and, going back to London, returned to his ships again, and not much later he besieged London again. However, when day came, and King Edmund Ironside perceived that the Danes had fled, he returned at once to Wessex to raise a larger army. The Chronicle of John of Worcester, ed. and trans. Jennifer Bray and P. McGurk (Oxford, 1995) vol. ii, pp.487-9 (paragraph breaks added). After St John's Day [Edmund] joined battle with them again at Sherston, but it was broken off with the two sides equal, his English troops taking the first steps towards retreat under the influence of Eadric, who stood on the enemy's side brandishing a sword which he had bloodied in the battle by the bold slaughter of some country fellow, and shouting: 'Flee, flee, poor wretches! Look, this is the sword which has killed your king!' And the English would have fled immediately, had not the king heard of this and made for a prominent hill, where he took off his helmet and displayed his bare head to his fellow-soldiers. He then brandished an iron spear with all the force he could muster and hurled it at Eadric; but he saw it coming and dodged it, and it went astray and pierced the soldier who was standing next to him with such violence that it transfixed a second man as well. Gesta Regum Anglorum, trans. R. A. B. Mynors, R. M. Thompson and M. Winterbottom (Oxford, 1998), vol.i, p.315. 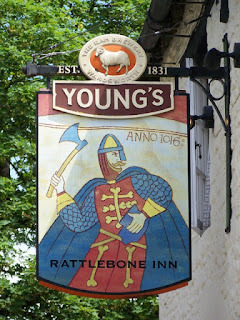 The urger of battle broke the sleep of the dark raven further south; the bold son of Sveinn made an attack at Sherston. Óttarr svarti, Knútsdrápa, ed. and trans. Matthew Townend, in Diana Whaley, ed., Poetry from the Kings' Sagas 1, Skaldic Poetry of the Scandinavian Middle Ages I (Turnhout: Brepols, 2012), Part 2, p.774. 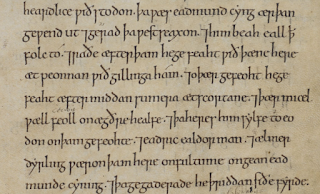 Quoting this verse, the thirteenth-century Knýtlinga saga goes on to give its own version of Sherston, which it calls 'one of the most famous battles of the time'. 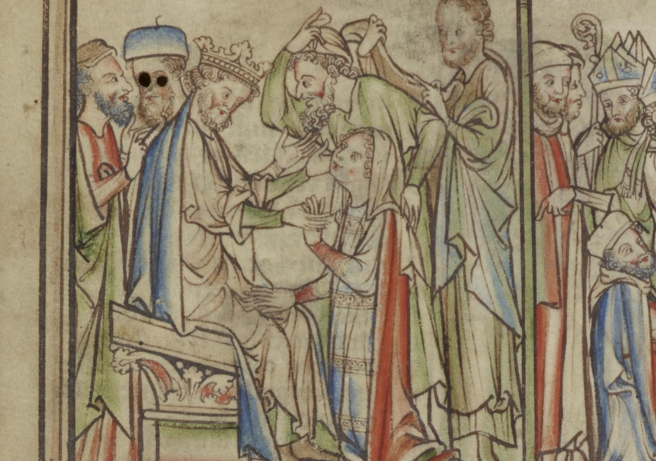 It has the same story that the English soldiers fled when they believed Edmund to be dead, 'and though the king shouted to them to turn back no one showed any sign of hearing him'. But more importantly, there's also a fascinating story about the aftermath of the battle. The saga tells how one of Cnut's commanders, his brother-in-law Ulf Thorgilsson, is separated from the rest of the Danish army in the confusion, and loses himself in a forest. He comes upon a boy tending a flock of sheep, and asks him his name. The boy, whose name is Godwine, recognises Ulf as one of Cnut's men, and warns him that if any of the people living nearby find him in the forest, he'll be killed. Ulf asks Godwine to guide him back to the Danes, and offers him a gold bracelet as a reward. Godwine refuses to take the reward - canny boy! - saying that he would rather have the earl in his debt if he manages to save his life. Godwine takes Ulf home and introduces him to his father, a prosperous farmer named Wulfnoth. (Can you see where this story is going?) The family look after him, feed him, and give him horses to get him back to the army. In return, Wulfnoth asks the earl to take Godwine with him and find him a position in service among the Danes - 'he can't stay here if the locals discover he's helped you escape', he says. Ulf and Godwine ride off and join Cnut and the rest of the Danish army, at which point Godwine realises that the man he's helped is an important and popular earl. Ulf takes him in, and it ends with Godwine marrying Ulf's sister Gytha and eventually being made an earl when Cnut becomes king of England. He becomes, in fact, Godwine, Earl of Wessex, one of the most powerful men in eleventh-century England. It's unlikely that much, if any, of this story is true; Godwine's father Wulfnoth was almost certainly not a farmer, but a Sussex thegn. However, it is true that Godwine married Ulf's sister, and from their marriage sprang a family which helped to reshape the ruling dynasties in both England and Scandinavia, long after the conquest we're commemorating here. The children of this Anglo-Danish union outlasted Cnut's rule in England, surviving and holding high positions throughout the reign of Edward the Confessor, with at times greater influence than the king himself. 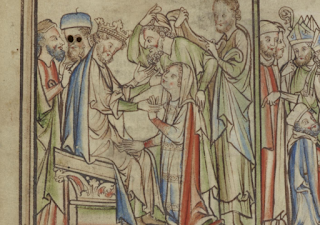 And half a century after 1016, of course, the sons and daughters of Godwine and Gytha were to be important players in another conquest of England: their daughter Edith married Edward the Confessor, and Gytha lived to see (though Godwine did not) her son Harold on the English throne. Today this family is usually called the 'Godwinesons', a testament to their father's dominance of English politics; but Gytha seems to have been a formidable woman in her own right, and her family connections in Scandinavia were an important influence on what happened in 1066 and afterwards. Through their mother, Harold and Edith and their siblings were closely related to the royal family of Denmark, Ulf's children with Cnut's sister Estrith. Exactly fifty years after the Battle of Sherston, in the summer of 1066, Gytha was at once mother of the king of England and aunt of the king of Denmark - although it didn't last, of course. Gytha lost three of her sons in one day at the Battle of Hastings (and one at Stamford Bridge, a few weeks earlier). In 1067 she left England with some of her surviving children and grandchildren, and eventually took refuge with her nephew in Denmark. Her granddaughter, Harold's daughter (also named Gytha), married into a ruling family in Kievan Rus, while in 1069 and 1075 her nephews intervened to aid English rebellions against the Normans. As Knýtlinga saga says, 'many great men from England, Denmark, Sweden and east from Russia are descended from them [Godwine and Gytha]'. It's not very likely that this all began with a chance encounter between Ulf and a young shepherd-boy, but it's a fascinating origin myth for this hugely important dynasty. And the really interesting thing is that one English source tells a very similar story about Godwine's humble origins: Walter Map in his De Nugis Curialium also has Godwine rising from obscurity through his unwitting attendance on a surprise guest, although in that case it's King Æthelred, who has got lost while hunting and ends up taking the attentive boy into his service. So the story in Knýtlinga saga takes on a shade more credibility; and it's not impossible that at least it was around the time of the Battle of Sherston that Godwine went over to the Danes. Without I have all belongs thereto? This verse is said to represent what Edmund promised Rattlebone to persuade him to fight. In the battle Rattlebone was mortally wounded, but staunched the flow of blood by pressing a stone tile to his wound, and fought to the bitter end (the pub sign above illustrates him doing so). What a splendid legend - I do like the thought of doughty John Rattlebone going up against Thorkell and Ulf! I blog about the literature and history of medieval England, as well as about saints, churches, folklore, Vikings, poetry, and anything else that interests me. Unless stated otherwise, all photographs and other content on this site are my own work; please don't use or repost them without attribution. New Article: "The prophetess and the pope: St. Hildegard of Bingen, Pope Benedict XVI, and prophetic visions of church reform"
A Place for Corpus Christi in the Anglican Church. The Church is in Need of Her Saints. The Running Hare. Ceramic Design by Verdant Tile.